Every day, we are reminded of our direct effect on the world around us—the Pacific island of garbage twice the size of Texas, the billions of plastic water bottles thrown out each year, the millions of sea birds and marine mammals killed by our collective debris. But there is a great disconnect: we hear about the problems, we can understand the implications for us and for Earth, but we still consume and discard flagrantly. Our daily habits, our conveniences, our latest and greatest products defy any regard for our legacy on this magnificent planet. 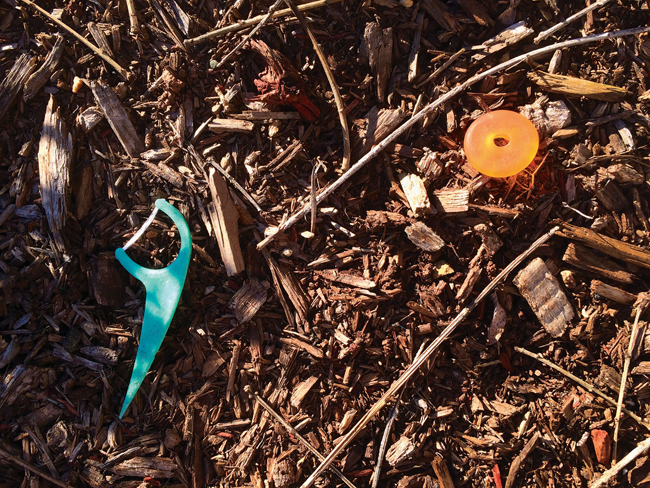 Naturalist and poet Jen Payne responds to this conundrum with a heartfelt and heady collection of writing in Evidence of Flossing: What We Leave Behind. Inspired by Henry David Thoreau, John Muir, and Mary Oliver, she helps us explore how our human condition can be healed by rediscovering our divine connection with nature. This curious, full-color book includes 75 poems that are underscored by an absurd and heartbreaking assortment of original and vintage photographs, including a series of discarded dental flossers that prompted the title of the book. Evidence of Flossing: What We Leave Behind follows on the heels of Payne’s 2014 well-received book LOOK UP! Musings on the Nature of Mindfulness and continues a dialogue about our innate and spiritual connection with nature. Jen Payne lives and works in Connecticut. She is the owner of Words by Jen, a graphic design and creative services company founded in 1993, and a member of the Arts Council of Greater New Haven, the Connecticut Poetry Society, Guilford Arts Center, the Guilford Poets Guild, and the Independent Book Publishers Association. Her writing has been featured in several art installations and published by The Aurorean, Six Sentences, the Story Circle Network, WOW! Women on Writing, and The Perch, a publication by the Yale Program for Recovery and Community Health. For more information or to order books, please visit the Three Chairs Publishing website, www.3chairspublishing.com. Books may also be purchase through online and independent booksellers. 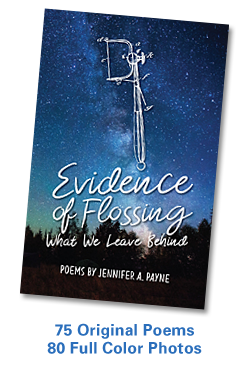 Jen Payne is available for book readings, book signings, or small discussion groups featuring poems from Evidence of Flossing: What We Leave Behind, essays from LOOK UP! Musings on the Nature of Mindfulness, or a combination of both. Please contact us for more information or to schedule an event today! This entry was posted in Books, Conversation, Nature, Poetry, Spirituality. Bookmark the permalink. ← Buy the Book Today!